A U.S. Senate committee moved Eric Fanning a step closer on Thursday to becoming the first openly gay civilian to lead a U.S. military service by approving his nomination as Army secretary. 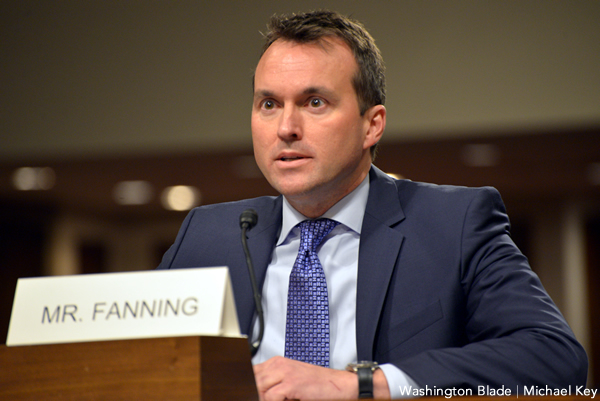 The Senate Armed Services Committee, which has jurisdiction over Fanning’s nomination, approved the nomination by voice vote nearly six months after President Obama announced his choice of Fanning as the next Army secretary. The committee approves the nomination after it held a confirmation hearing for Fanning in January that went smoothly for the nominee. No member of the committee asked Fanning a question about his sexual orientation or objected to having an openly gay Army secretary. Although the committee has approved the nomination, Fanning faces difficulties in obtaining confirmation by the full Senate. Sen. Pat Roberts (R-Kansas) has placed a hold on the nomination, citing comments President Obama made about closing the detention facility at Guantanamo Bay. A Roberts spokesperson told the Blade on Thursday the hold remains in place. Thorn said OutServe-SLDN recently sent a letter and petition with over 680 signatories to Roberts regarding his hold. The LGBT military group, Thorn said, will work with Senate allies and continue to petition Roberts to schedule a confirmation vote for the nominee. “Our service members are risking their lives to serve and protect our country and should be afforded the respect of having a secretary who will advocate for them, think about their needs and serve them the way that they serve our country,” Thorn concluded. Ashley Broadway-Mack, president of the American Military Partner Association, said she’s “thrilled” to see the approval of Fanning’s nomination in committee and urged the full Senate to confirm him. Is this type of appointment permanent or only valid as long as Obama is President? Can this man be removed from the job by another administration?